the Google Chat Program, Read Science! 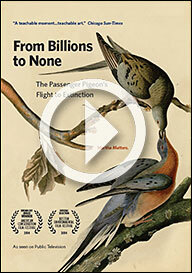 Guests include Joel Greenberg, author of "A Feathered River Across the Sky" and documentary producer David Mrazek, who directed the film about the life and extinction of the passenger pigeon, "From Billions to None." Also appearing are researcher Dr. Laurie Marker joining from Namibia, and returning Read Science! guest, photographer Suzi Eszterhas in Los Angeles, to speak about their work with cheetahs as told in the book "A Future for Cheetahs." A conversation about media makers working with scientists to share the important message of conservation with the general public. Airdate, Tuesday, March 10. View the Preview for the From Billions to None film, Here.